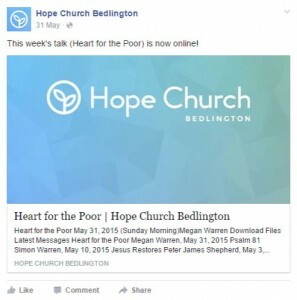 There are many ways in which a Church website can serve its audience; an audience which is becoming increasingly au fait with communicating online. In fact companies sell online church-management systems that do everything from track attendance to organise rotas, but we’ve found much of this can be covered in a simple WordPress site if you know what plugins & settings to implement. So Church websites can do so much more than merely displaying static content like a printed leaflet, but what is possible (and moreover what is useful) for Churches to use? There’s so much information online that if it’s splurged out all at once and not prioritised and categorised appropriately, the user gets overloaded and can’t find what they need. Essentially, users will need 20% of your functions 80% of the time, so the remaining 80% can be hidden a click away e.g. on a submenu. A lot of examples can be found in the toolbars of modern software. Once you’ve determined what you want to show and prioritise, its level of importance should be reflected in it’s prominence on the page through things such as size, position, thickness and colour. You want the user’s eye to be guided through the page – if it’s wavering with indecision it will get fatigued an result in a bad user experience. Everything listed here is modular & optional, so can be built upon a bit at a time. Adding functionality in stages can help stagger the users’ learning curves, spread the project’s budget and be helpful for testing, whilst adding everything at once can often prove too much for either the church congregation or its leadership to take on board. Set to private, this can be great to keep members in touch with one another and allow them to build community. You can choose what fields to include on the profiles, and then members can update their details as and when they change. Gone are the days of having to wait a year for the next publication! With many churches recording their talks, we use a plugin that allows you to easily post them on your website and categorise them in terms of date, speaker, topic, sermon-series etc. Any Bible references appear as pop-up windows when clicked and you can even embed your slides, notes and video too. The talks appear as an embedded audio/video player but visitors can also click the option to download it onto their machines for offline listening, and the system can also be linked to populate a podcast on iTunes. A ‘Subscribe to new posts’ form is useful for people who want to be kept up to date of new material. 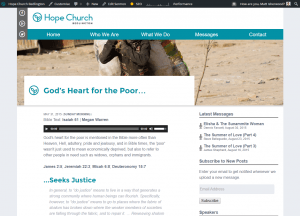 They can enter their email to get notified whenever a new blog post or sermon is published to the website, or if they use RSS feeds they can just add /feed or /rss to the end of the url. This is key for both members and visitors alike; promoting and providing practical information for your events. The plugin we use generates a calendar or list view on your website, and gives each event it’s own page with information on where/when/how the event is happening as well as space to describe and promote the event. The venues are saved and linked to google maps navigation and there are buttons to import each (or all) events into digital calendars. You can even have online registration and restrict tickets if places are limited, plus taking payments online is also possible in the premium version. Not as many Churches will need this, but if you sell books, CDs, or crafts etc. for fundraising you can do so from the website and take online payments via trusted gateways such as PayPal. This separates the two target audiences; sensitive information that you don’t want public on the web can be set to ‘Private’, meaning people would have to log in to be able to view the page. This may be particularly useful for prayer requests, personal details or things that would be irrelevant for non-members such as news nights or ‘AGM’s. If you want to take that even further you can set up different permission levels for different groups of users allowing viewing, moderating and even editing or publishing changes to content. This can be especially helpful as the Church grows too large for one person to manage. Permission can be given to the outreach team to manage the outreach events, to the kidswork team to keep the kidswork pages up to date, to the audio team to upload new talks and to the bookshop manager to manage online sales. Uploading video to your site takes up a lot of space & bandwidth, so it’s widely recommended to create a YouTube account, upload your videos there, and instead embed them on your site. That way visitors can still view the video content on the church website, but YouTube will optimise and deliver it. Plus you’ll get the added benefits that publishing your content on the YouTube network brings. Our clients haven’t as yet added this to their sites, although there are staff schedulers around such as ShiftController. Some of the clients we talk to recommend using Doodle for gathering people’s free/busy dates and then creating a shared spreadsheet for people to view. If the current shift-rota plugins don’t cover this properly maybe we should write a new plugin for this… watch this space. If you want to host a lot of online discussions you could easily add a members forum to the church website, but for most churches we’d recommend starting a private facebook group. (We’ll cover this more in part 5) That way you’ll get a lot more engagement and integration with people’s daily lives, but it does assume that your members have facebook accounts. But, as mentioned earlier, all of the above is modular so it’s worth determining the priority of each function’s importance to your congregation. Then you can release the changes gradually over a period of time, or at least know which features you need to be highlighting and which to file discreetly under a submenu. Next week in we will be taking a break to give some practical guides on how to get started with things such as hosting and domain names. Then In part 3 we’ll be looking at how to increase your chances of appearing in search results and getting noticed online. And in part 4 we’ll be looking at how to use social media to your advantage.